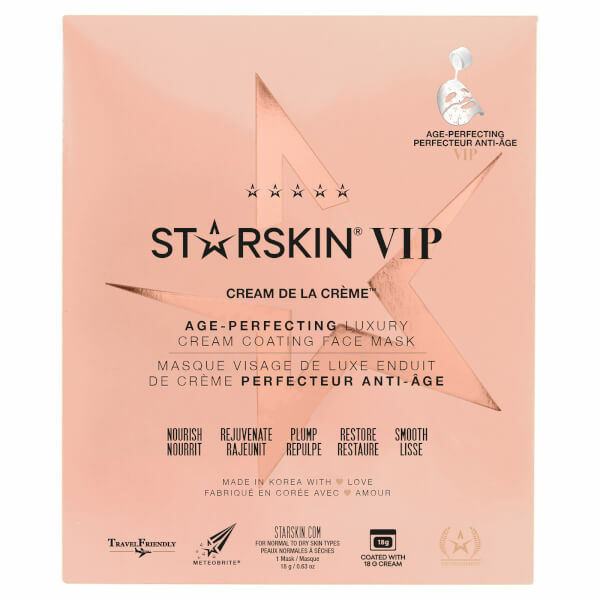 Envelop your skin in total nourishment with the STARSKIN VIP Cream de la Crème Age-Perfecting Luxury Cream Coated Sheet Face Mask. The innovative two-layer treatment uses an inner mask which is concentrated with a rich serum to hydrate the skin, and an outer shield to lock in nutrients and improve absorption for maximum efficacy. 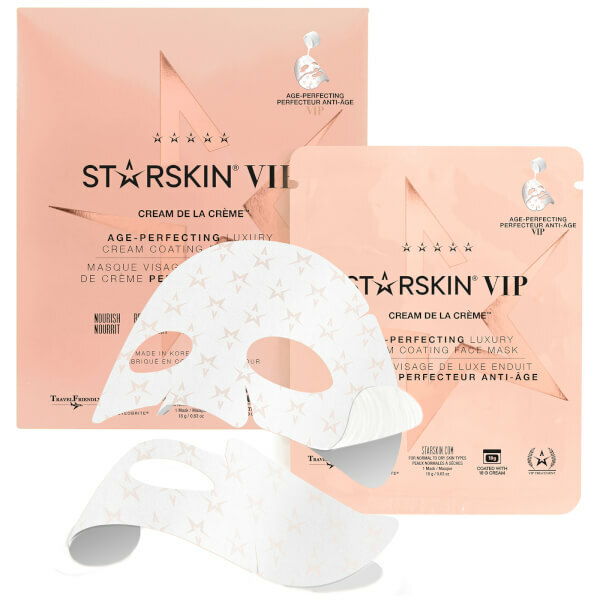 The sheet mask pumps the skin full of moisture to firm and tone the facial contours while smoothing out fine lines and wrinkles, leading to a more youthful-looking complexion. Delivering the equivalent of half a jar of anti-ageing cream in one treatment, you can expect glowing and revitalised results. Water, Dipropylene Glycol, Diisostearyl Malate, Betaine, Pentaerythrityl Tetraethylhexanoate, Hydrogenated Poly(C6-14 Olefin), Polyglyceryl-3 Methylglucose Distearate, Hydrogenated Polyisobutene, Dipentaerythrityl Hexa C5-9 Acid Esters, Hydrogenated Vegetable Oil, Behenyl Alcohol, Butyrospermum Parkii (Shea) Butter, Theobroma Cacao (Cocoa) Extract, Panax Ginseng Root Extract, Panax Ginseng Berry Extract, Centella Asiatica Extract, Gardenia Florida Fruit Extract, Paeonia Albiflora Root Extract, Glyceryl Stearate, Cetearyl Alcohol, Chamomilla Recutita (Matricaria) Flower Extract, Butylene Glycol, 1,2-Hexanediol, Meteorite Extract, Castanea Crenata (Chestnut) Shell Extract, Chenopodium Album Flower Extract, Plantago Asiatica Extract, Rehmannia Glutinosa Root Extract, Dextrin, Paeonia Suffruticosa Root Extract, Tromethamine, Stearic Acid, Carbomer, Glyceryl Caprylate, Ethylhexylglycerin, Fragrance, Disodium EDTA, Courmarin, Hexyl Cinnamal, Butylphenyl Methylpropional, Limonene, Linalool.